There are now 12 beaches that comply with Regulation NMX-AA-120-SCFI-2006: two have new certificates, five were confirmed and another five are still current for another year. As he awarded the certificates during the laying of the cornerstone for the Costa Canuva project, Roberto Sandoval, Governor of Nayarit, noted the Riviera Nayarit continues to be the national leader in Certified Clean Beaches under regulation NMX120-SCFI-2006, set out by the Ministry of Environment and Natural Resources (Semarnat by its acronym in Spanish). The Destination grew from having 10 certified clean beaches to boasting 12 with the addition of Guayabitos and the Isla del Coral, which received their certificates for the first time. Playa Becerros in Costa Canuva, Playa Platanitos in Compostela, Playa El Borrego in San Blas, Playa Nuevo Vallarta Norte II and Playa de los Muertos in Sayulita were all confirmed, the latter two being in the municipality of Bahía de Banderas. The seven aforementioned beaches are joined by five others with certificates that are still current for another year: Chacala in Compostela and Bucerías, Playa Nuevo Vallarta Sur, Playa Nuevo Vallarta Norte and Playa Palladium, these four also in the Bahía de Banderas area. When counting by municipality, Bahía de Banderas comes out ahead with the most clean beaches at six, followed by Compostela with five and San Blas with one. 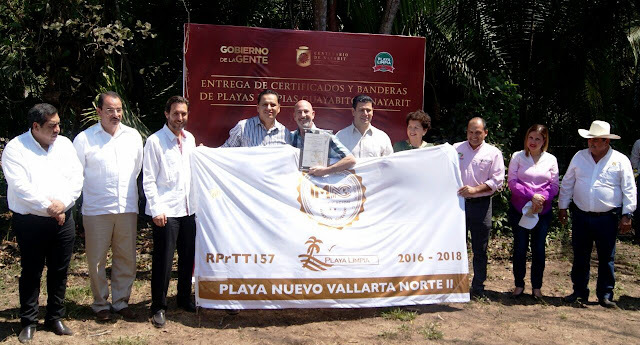 Speaking of environmental certificates, Nayarit also has three Blue Flags, one at the Marina Riviera Nayarit in La Cruz de Huanacaxtle, one in Nuevo Vallarta and the third in the Santa María del Oro Lagoon.